This craft can be adapted for toddlers or to help school-age children with their scissor skills. Print off this template of the lucky clover and the pot of gold. 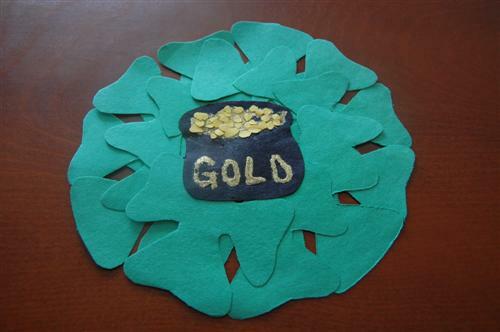 Cut out and use to trace 10-15 clovers on green paper and 1 pot of gold on black paper. Cut out the clovers and pot of gold. Use the hole punch to make tiny gold coins out of the yellow paper. Place the pot face down on work surface and glue clovers to it in circles. Turn over and use the glitter glue to write gold on the side of pot and "fill" the pot with gold. While the glitter glue is still wet sprinkle some of the gold coins at the top of the pot.